April was Overflow Action Month and Friends planned 30 days of action and awareness of water conservation activities that help the Chicago River, ranging from sharing "How To" tips to taking the Overflow Action Pledge to joining a virtual happy hour with water-friendly beverages. 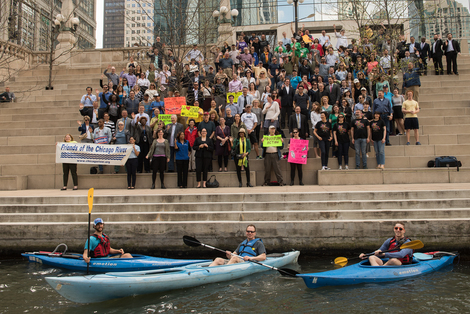 Click here to download the Overflow Action Month calendar and start helping the Chicago River today. Join us on April 27, 2018 along with our partners, friends, fellow Chicago River lovers for the largest river photo bomb! Last year's event was so inspiring that we are doing it again. Stay tuned for details.